This is 23 year old Ahmad. He is from Aleppo in Syria but fled to Lebanon five years ago due to the Syrian conflict. Ahmad tells a story of a beautiful Syria where people were happy and children went to school. Syria was safe and no one in his surroundings had experienced war, people loved and cared for each other. However, their lives were disrupted when the war in Syria started in 2011. “It’s ironic,” says Ahmad. “When we were young we used to hope that our schools would be bombed so we could escape to go to school but when we grew up and the schools were actually bombed our dreams were lost with those schools”. In Lebanon, life has not been easy for Ahmad. He struggled a lot when he first came here not knowing how he to build a new life for himself. Lebanon is different, it is expensive and he could not access free education like in Syria. Ahmad wanted to study at the university but the only way he could do that was to risk his life and go back to Syria to get his high school diploma. 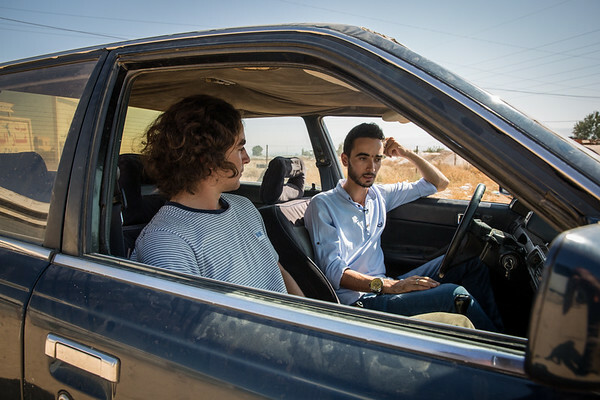 “I returned to Syria to complete my final exams and got my high school diploma,” he explains. It took him three times to pass the exams but eventually he did. Studying in Lebanon is difficult as the tuition fees are very expensive and the curriculum is in foreign languages. Ahmad therefore had to rely on getting a scholarship and working on the side of his studies. He is currently studying two majors at university and volunteers as much as he can with different humanitarian organisations. Ahmad decided to study civil engineering because when the day comes and he can return to Syria, he want to help to rebuild his country. “It is important to return to Syria one day. I need to build up my country and I will always love Lebanon for the support and generosity people showed me”, he says. He is determined to stay positive to continue follow his dreams and create solutions to change his society for the better. That, he says, is his revenge on the people who destroyed his home country. “Education is a weapon. It is the weapon for change. It will be our weapon to rebuild our country and get back to live a better life”, Ahmad states. "I feel happy when I do social work. I enjoy help others and I am motivated by love, says Ahmad. “Love is one of the most beautiful things in the world and it comes in many forms, if you help others and they say thank you that is enough to give you power and positive energy,” he explains. He has even fallen in love. “”I met a girl who was studying with me at university. She is from Damascus and our personalities get along,” says Ahmad. It is as if we are soulmates and two months ago, we got engaged.